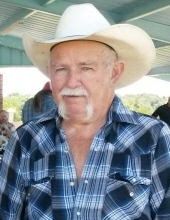 Funeral services for John Larry Martin, 78 of Princeton TX, is set for 2pm Wednesday, January 30, 2019 at Scoggins funeral home Chapel in Van Alstyne, TX. Burial will follow at Van Winkle cemetery in Princeton TX. Family night is Tuesday January 29, 2019 6pm to 8pm at the funeral home. John Martin was born June 27, 1940 in Griffin Georgia to Marcus Martin, Lucille Martin. He passed away on January 23, 2019 in McKinney TX. He survived by his wife Shelia J. Martin of Princeton, Daughter Nina Cash of Garland TX, Jennifer Martin of Emory TX, Sons Bobby Martin of Athens TX, John Martin JR of Garland TX, Jerry Martin of Palestine TX stepsons Donald Smith of Arlington TX, Pat Walton of Princeton TX. Sister Gail Deering of Florida Brothers Ronnie Martin of Sachse TX, Jack Martin of Bonham TX, 19 grandchildren, 8 great-grandchildren And Many Many Friends. He was preceded in death by his Parents Marcus Martin and Lucille Martin, brother Franklin Martin sister Linda Hardwick and Daughter Randhi Jo Allen. Services are under the direction of Scoggins Funeral Home & Crematory, 637 W. Van Alstyne, Van Alstyne, TX; 75495. 903-482-5225. You may sign the online register book at www.scogginsfuneralhome.com. To send flowers or a remembrance gift to the family of John Larry Martin, please visit our Tribute Store. "Email Address" would like to share the life celebration of John Larry Martin. Click on the "link" to go to share a favorite memory or leave a condolence message for the family.